After Stream2 launches, you are presented with the Electronic Program Guide (EPG). 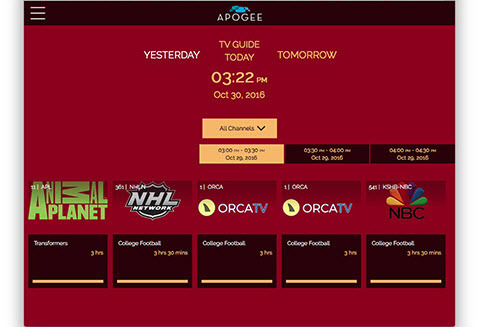 The EPG gives you access to the current Stream2 programming line-up, changing the channel, and to play programs in the Video Player. This section describes how to use these features. If you are having any issues with this Stream2 app, please contact Apogee customer support. 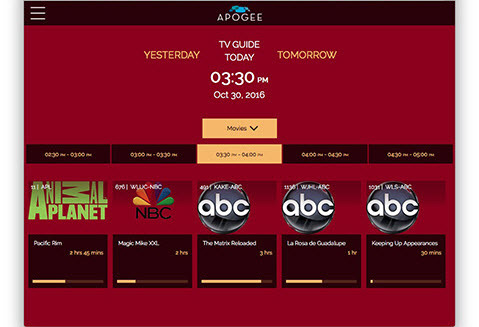 After Log in, you will see the EPG, or 'TV Guide.' 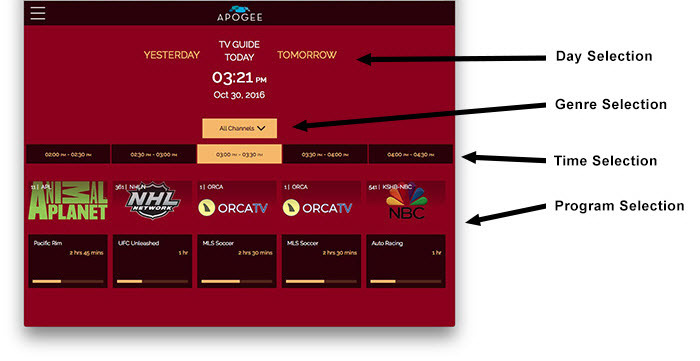 The easiest way to understand the EPG in the Stream2 desktop Web browser user interface is to start at the top of the EPG view and make your way down the screen to choose the day, genre, times, and programs. First, select the day. The view defaults to the current day and time. The horizontal bar below the day is a 'Time Selection' bar that scrolls left and right to select different times of the day. The row of items below the Time Selector is the 'Program Selection' bar, which lists the programs that are available at the time that was selected in the Time Selection bar. Like the Time Selection bar, the Program Selection bar also scrolls from left to right, so you can review the full range of programs that is available at the selected time, across all channels. To go back to Yesterday's programs, click on Yesterday. You will be presented with programming that is up to 24 hours before the current time. The word 'Yesterday' will be highlighted. Click on 'Today' to go back to the programming that is on now. You will see the current time just below 'Today.' Just below the date and time, select the drop-down menu to filter the available programming by genre. 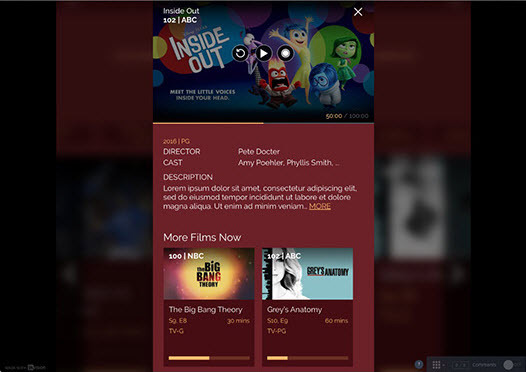 Selecting the 'Movie' genre will display current movie programming only, for the current time (in this example, between 3:30pm and 4:00pm. To display a listing of the programs that are on at a future time, hover your cursor over the row of past, current, and future times. 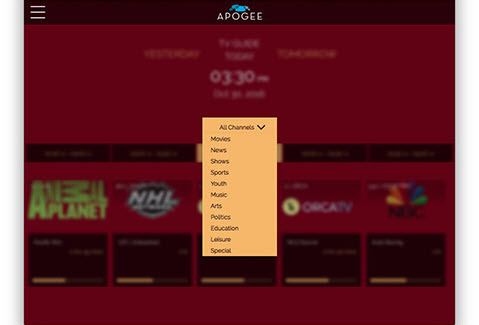 No matter what date or time is selected, the programs can be filtered by genre. Clicking on the arrows at either end of the time bar will scroll the time forward or backward up to 24 hours. In this example, the EPG is scrolled forward to the next midnight, and shows the Movies that are available at that time. The top of the Program Info window is designed to display a thumbnail image that represents the program. A triangular 'Play' button appears overlapped at the center of that image. Below the image is further information about the program, as well as the programs that are adjacent to it in the EPG. When you select the Play button on the program image in the Program Info view, the program will invoke the Video Player in that window. 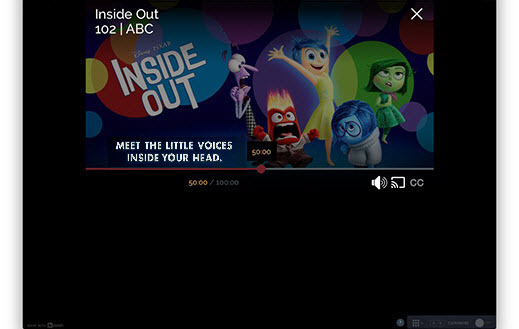 The Player Window will dismiss the EPG and the video will begin to play. 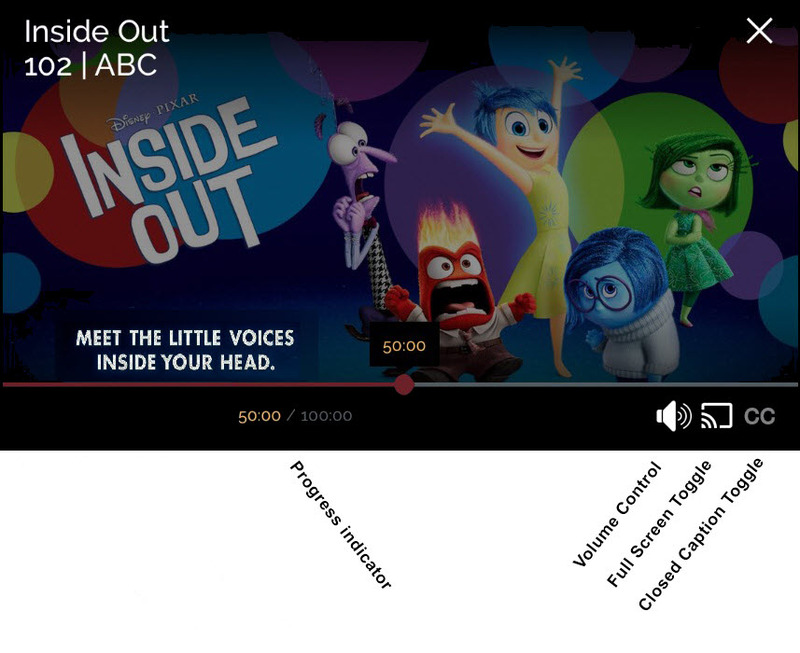 The Video Player window has a series of controls at the bottom. After a short time, the controls will disappear (time out). They reappear when the mouse is moved over the Video Player window. Volume controls can be found in the lower right hand corner of the screen. Toggle the Video Player to Full Screen view using the control to the right of the Volume control. Press 'Escape' or the 'X' to dismiss the full screen view. The Closed Captions control can present the captioning in three sizes.